Tad Newton’s Jazzfriends Celebrate 35 Years of Sunday Lunchtime Jazz! Tad Newton’s Jazzfriends along with Celebrity Guest Stars put on quite a show to celebrate 35 years of his Sunday Lunchtime Jazz Sessions: 1983-2018! 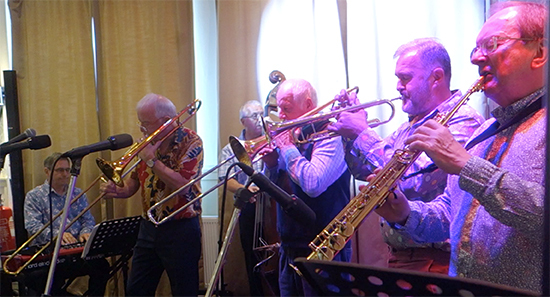 What better way to mark the occasion than with footage filmed at The Walnut Tree Jazz Club on the day. But first, a YouTube of The Jazzfriends’ at Fest Jazz 2018 in Brittany, where they were acclaimed joint second favourite band. Falling, Tad? Far from it. You negotiated that footpath at Fest Jazz just as you’ve negotiated the challenges of jazz over the years to keep it live and alive. Thanks, Tad, for all you have done and continue to do for jazz! Dave Browning … exciting Harlem stride piano star! Roy Williams … jazz trombonistextrodinair! Six decades of being a Jazz fan, and I had never come across a bass clarinet in jazz in this country (and only Eric Dolphy worldwide) – then in the space of two months – TWO ! I am sorry not to have been at Tad’s Jazz Day to hear Richard. The other bass clarinetist was heard at the end of July at Fest Jazz, and was Amanda Brown’s excellent reeds player, who contrived to produce a rather more distinctive ‘eerie’ sound than Richard, out of that unusual instrument.